In America, February is observed as ‘Black History Month’. My meditation and works move towards creating a legacy for following generations to glean. Most of the masters in the Arts were not appreciated, during their time of creativity on planet Earth. Many times I believe/feel as if I am underappreciated on a larger scale. I do have a solid, core of supporters/admirers of my creative works. I am quite grateful for this. E as Poetlove Water will go down in the ‘Black Ourstory’ books. For those in the Brooklyn, NY, you will have an opportunity to witness a monumental event before your glory-seeking eyes. On Saturday, 21 February from 3-5 PM, ‘My Relation to the Sun’ Book Release and Party’ will commence. 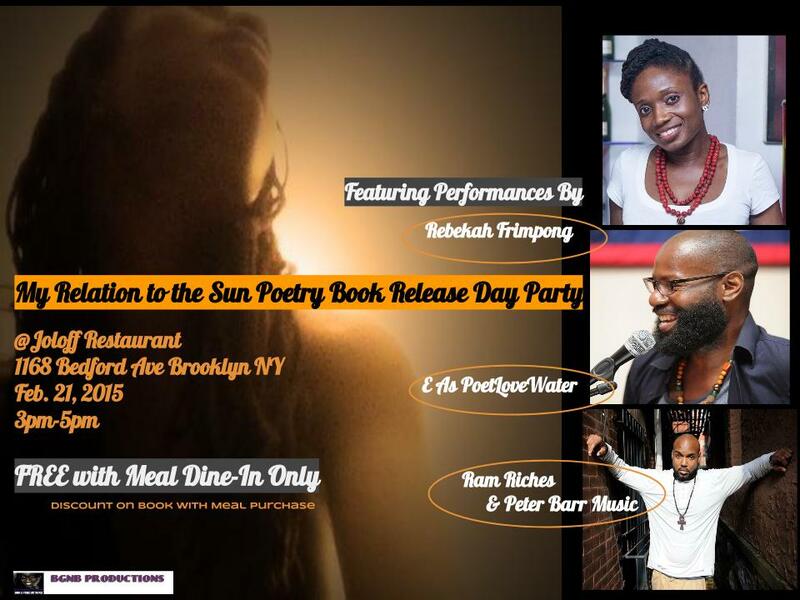 Rebekah Frimpong, Brooklyn-based poet/filmmaker/artiste, will be celebrating her 1st published book release. E as Poetlove Water is one of the featured poets for the evening. A few pieces from the forthcoming book, The Cells of the Tissue That Should Feel, will be presented. Additionally, E as Poetlove Water’s original jewelry will be available for admiration/purchase. The event will be held at Joloff Restaurant, 1168 Bedford Avenue, Bedford-Stuyvesant, Brooklyn, NY. For more information, please contact E at me@easpoetlovewater.com. Hope to see your face and feel your presences!! !